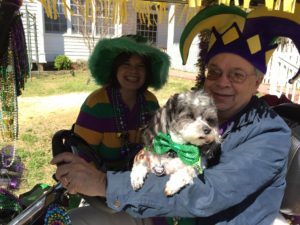 Festival season comes to Jefferson Texas each winter in the form of Mardi Gras! Jefferson has a long history of traditions and architecture that comes from New Orleans Louisiana. This is one of the traditions that is still going strong in East Texas. Jefferson rolls out the red carpet for visitors each year with super fun music, vendor’s and the parades. Purple, Green and Gold are everywhere you look. As well as the people in costume and of course beads galore. 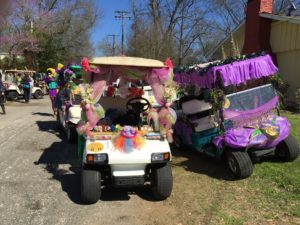 Last year a few of the local Golf Cart owners joined in the festivities as the Krewe of Karts. David and I jumped at the chance to not only now watch the parade from the streets but BE in the parades this time. We had a blast! I can’t even try to explain the rush and excitement of actually driving down the parade route. It was exhilarating. This year’s theme is Literary Treasures. I am on pins and needles to see the creative ideas for the floats and costumes this year. You can get more information on the Mardi Gras Upriver website, they have the schedule of parades, Music and activities. February 9 thru 11, 2018 It is going to be a party in Jefferson! Be sure to wave at us as we are going by and throwing beads your way. 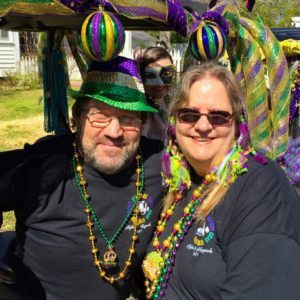 This entry was posted in About Us, Mardi Gras Upriver, Winter Attractions by Tammy D. Bookmark the permalink.